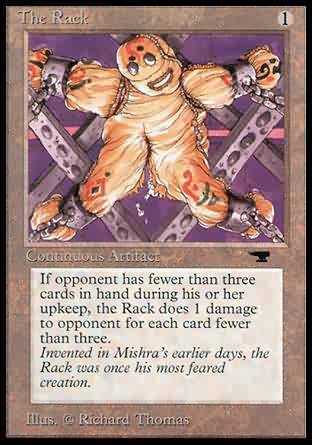 If opponent has fewer than three cards in hand during his or her upkeep, the Rack does 1 damage to opponent for each card fewer than three. As The Rack comes into play, choose an opponent. At the beginning of the chosen player's upkeep, The Rack deals X damage to that player, where X is 3 minus the number of cards in his or her hand.